The storage system that enables either maximum storage capacity or that gives you back valuable floor space. Suitable across a wide range of sectors and applications, it truly is one of the most flexible and highly customisable storage solutions on the market. 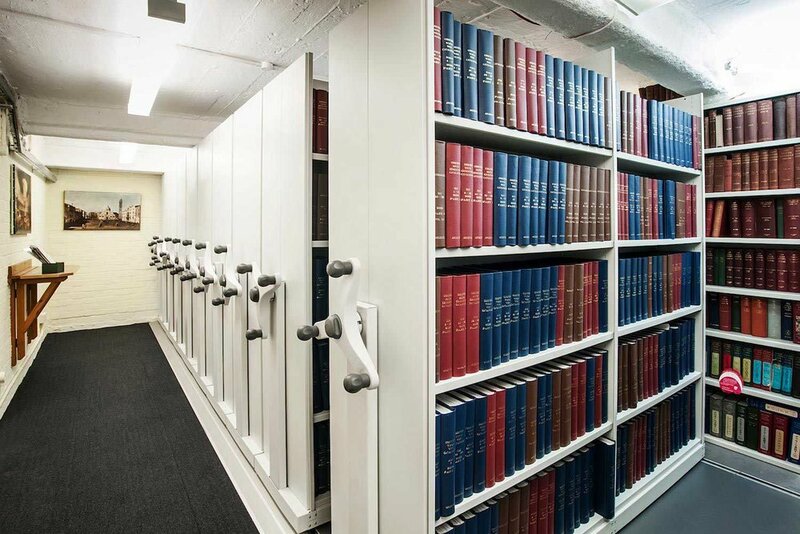 The example below showcases how even small spaces can benefit from mobile shelving. 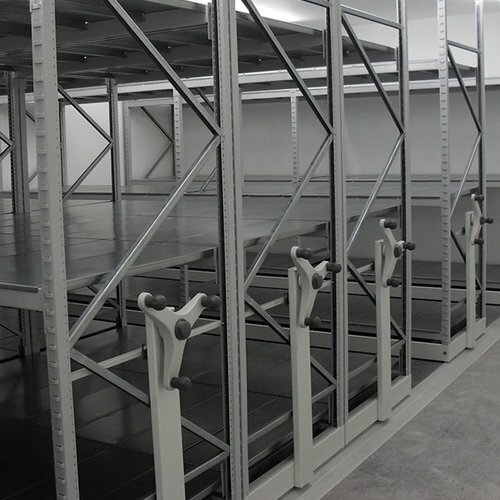 For this project we replaced old static shelving and provided the customer with a huge increase in storage capacity. The ideal storage system for office filing, archive storage and the storage of products. 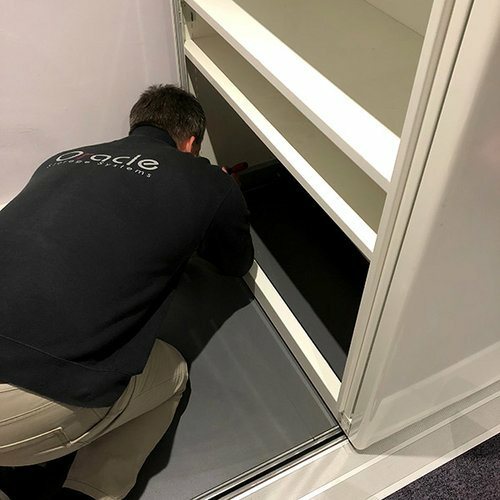 Our mobile shelving system can be tailored to your individual requirements to offer you the most cost effective and flexible storage solution and with our six step design process it really could not be simpler. Our most popular Mobile shelving system is surface mounted requiring no additional building works or fixing to the floor. Installation is noise and dust free and quicker than most other systems. Grouted and cemented systems are also available. Our modular system is 100% relocatable. The design ensures that if the system needs to be relocated, there is no need for any additional parts and no additional building works. Being 100% relocatable means the system is cost efficient and minimises environmental impact. We're proud that our mobile shelving systems are manufactured in the U.K. to the highest standards, it's how we offer an industry leading warranty & service contract. Steel 'C' section track supports the infill floor to provide a level and trip free system. 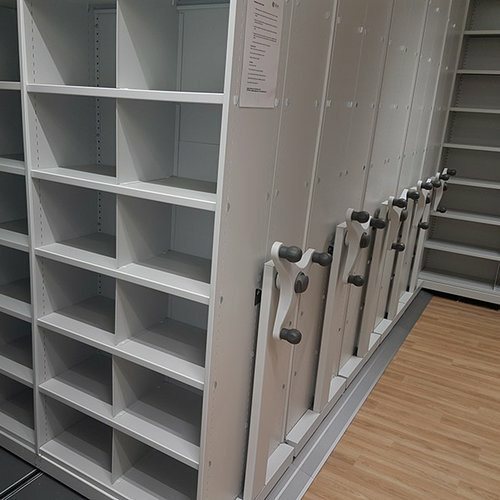 The mobile shelving system also features anti-tilt devices and safety lock handles to ensure safe operation at all times – complying with all health & safety legislation. Up to two bays deep and a total load of no more than 3 tonnes. Pull required is approximately 4.5kg per tonnes of load. A drive shaft is connected by a chain and sprocket to a manually operated hand wheel. The standard drive gives a mechanical advantage of 4:1. A force of 0.4kg is required to move each tonne of load. With a 24vDC motor which can be operated by pressing a key or linked to a computer system. Our new electric mobile shelving system is ideal for office environments with a host of features including safety stop, automatic object sensing and reverse and security built in. It's the perfect file storage solution for the modern office. 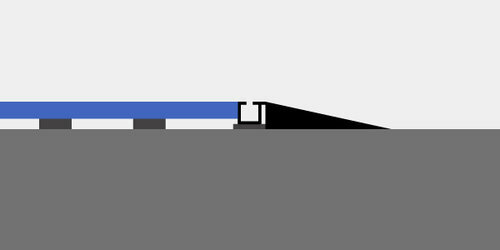 There are several different track options available depending on the product stored, its weight and the floor the system will be installed on. The most common track used is our System R Track, this is fully demountable and makes relocation and expansion simple as nothing is fixed to the fabric of the building. For example we often relocate mobile shelving on top of one of our industrial mezzanine floors. Mounts directly on the floor, ideal for level raised/computer floors. 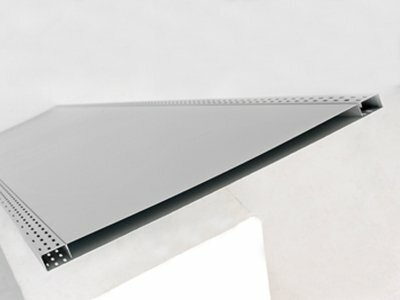 Requires the floor to have no more than 2mm deflection in any one metre direction. Mounts directly on the floor for lightweight installations, carpet tiles installed between tracks. 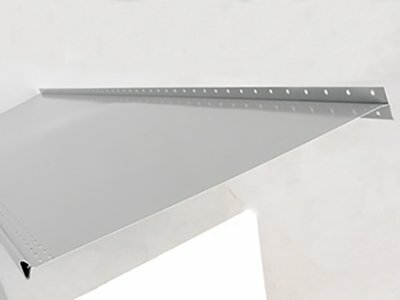 Requires the floor to have no more than 2mm deflection in any one metre direction. Our standard track system is fully demountable, levelled and includes false floor (carpet tiles can be installed). Ramps are included to avoid trip hazards. Ideal for uneven floors, these tracks are levelled and grouted directly onto the existing floor. Then a false floor is added between the tracks, ramps are included to avoid trip hazards. Tracks are installed into a solid screeded floor, this provides a seamless finish, greater weight bearing and is a permanent installation. Designed specifically for raised server and data centre environments. Our range of mobile shelving accessories are ideal for the creation of a custom designed solution. Accessories can be easily retro fitted. 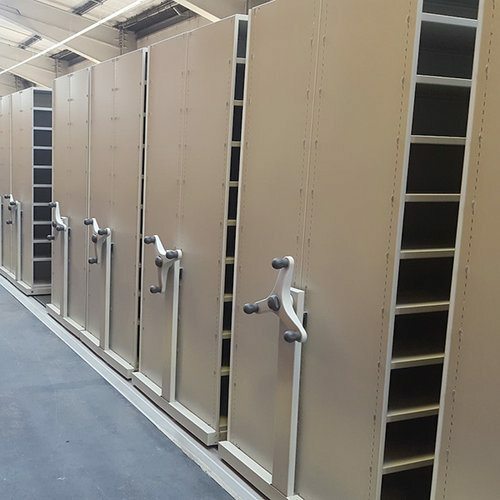 The world renowned auction house Christies in London, needed to update their existing storage system in several areas. This was to house a growing number of bound catalogues, dating back to 1766. 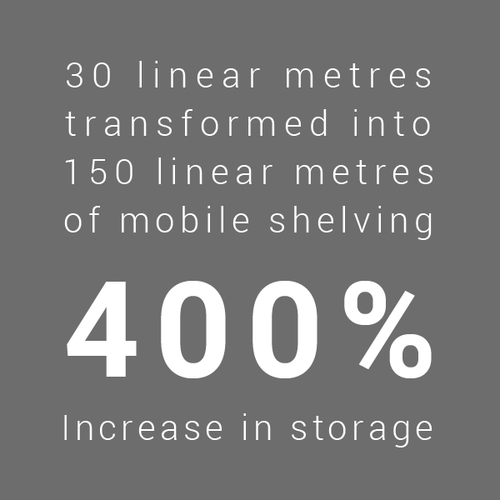 The mobile shelving system was designed to maximise storage in each room, while still allowing easy access to the archives and main routes through the building. Why not contact Oracle Storage to see how we can help you take control of your storage. We have a simple 6 step process to guide you from showing initial interest in mobile shelving right through to the final installation. Call, live chat or email so we can listen to your requirements and understand your storage goals. Whilst we can work from drawings we always like to survey in person. This enables us to review the products that need to be stored & consider all storage options. Once surveyed we can discuss and show you the different options available along with accessories if required, to help with your storage needs. We'll come back to you with a full detailed and itemised quotation including possible installation timescales. From placing your order we will begin to manufacture the mobile shelving system and schedule installation dates to suit your programme. Our SEIRS and CSCS carded installation team will install the system to the highest standard. 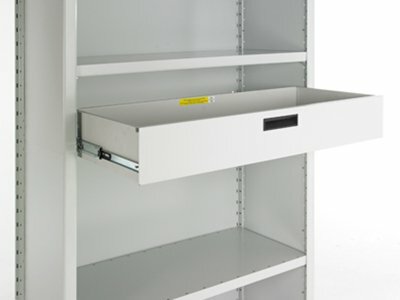 All of our mobile shelving systems come with a 12 month warranty as standard. 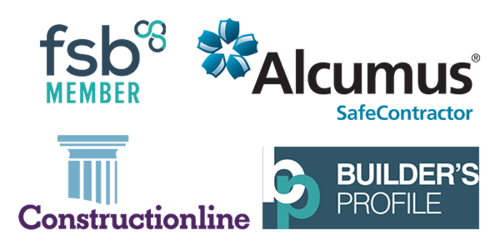 Beyond the initial 12 months we highly recommend a service & maintenance contract (to PUWER standards) is taken out on your system. This provides a number of services each year to keep your solution running smoothly. It also provides you with a emergency call out facility, if for any reason the system doesn't operate as intended. 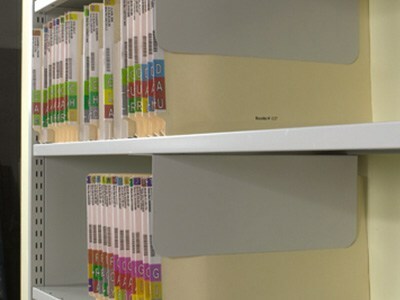 We can also offer this service to mobile shelving systems that weren't purchased directly with Oracle Storage. Click to download our latest mobile shelving brochure. Complete the form below to request a call back from us.